Lets have a cocktail...: Vamos a la playa! 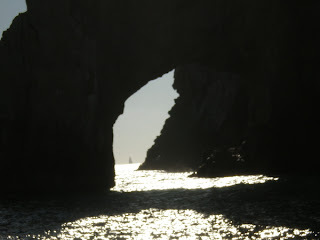 Live from Cabo....who doesn't love to wake up being greeted by sun, beach, and water? Cabo San Lucas...tu es muy bonita. I will say my mornings start a wee earlier than last time I was here, but I will take it. And JohnnyMac is so glad to be back. In his single days, JohnnyMac loved himself some frequent trips to Cabo (and Jamaica, St. Thomas, Florida, etc.) JohnnyMac has gotten shanked out of three trip to Cabo in the last four years. Let me explain. He was scheduled to come the year we met and had to cancel last minute because of work (CURSES). The next year, he surprised me with a trip planned over Thanksgiving. And then we got suprised by a tiny thing called procreation, and although I wasn't due until the following February, our baby Doc declared moratorium on traveling out of the country. So the next year, we planned a trip to take our little man who was born in January, but would not doubt be ready to rock the sandbar at 1o months old. Well, when flight time came near, our little man was sick. We would obviously cancel the trip and tell Hi Pie and the RevDoc who were meeting us there to go on without us. In a moment in incredibly loving love, JohnnyMac said, "You should go meet them. I will stay home with the baby." Leave my husband home with a 10 month old ? For six days? ABSOLUTELY! I couldn't have packed quicker if I had inhaled eight RedBulls back to back. I kissed him intently and rolled right on down the street to that big old Jet Airliner. So, while JohnnyMac stayed home, I sunned, went boating, and refreshed myself with Pacificos on the beachwith my little brother. Ahhhh...thats a fair exchange for nine months of hotel hosting a baby, yes? So this year, we are all set to go. Nothing is stopping us. Tickets in hand...until...what? Can you repeat that? Swine flu? Where did you say? In Mexico? You must be kidding me. Thankfully the potential pandemic has dwindled down but JohnnyMac did declare that if this trip was cancelled, he was officially breaking up with Cabo. But we are here, and that is a breakup I don't want to witness. You already know how much we love the beach. It serves as instant redemption for JohnnyMac after work, and the sometimes taxing upkeep of patience required with a two year old. This pic is from our little man's first trip to the beach, and I love it. Because our many subsequent trips, our son seems to have a proclivity towards the beach as well. And his interest is so genuine and earnest. And this in turn is appreciated by us. What did he say this morning? I LOVE CABO MOMMY. Uncle Hi Pie and the RevDoc are with us and we heard all about how my little brother won a sand castle building contest on one of his work retreats. (Sandcastle building on a work retreat? Sign me up.) And you know the Sand Castle champ rolled out a toolkit like Tim Allen and is set to make his godson the best sandcastle on the beach. 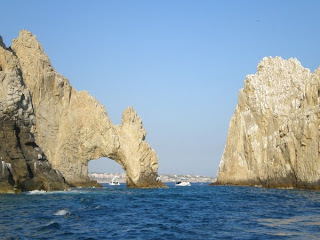 So Viva la Cabo....we missed you and are so glad to be back on your sandy shores. Hey! I really enjoy reading your blog. I'm a new mom with a 8 month old baby girl. My husband and I travel a lot. And it's really complicated the packing for her, there are so many things to carry that I don't know how to simplify this. Do you guys pack a bag for your kid or you share your own? What has work for you guys? Very nice blog! Love the photos. I would love to have a drink with you while watching the Young and the Restless. Was just looking at other Momblogs decided to stop by and say Hi!